Why would anyone want to burn fabric? Perhaps a better question is: have you ever wondered if a fabric you want to use in a quilt is 100% cotton? There is an easy test to check. Many of you may already know this, but I’m hoping some of you will find this helpful. Recently I was cleaning out the cupboard where I keep my quilt backing pieces and non-cotton fabrics. I found a piece of black and white polka dot fabric and wondered why it wasn’t in with the rest of my stash. Perhaps it was a polyester blend. Nothing on the selvedge showed fiber content, so I grabbed a book of matches, cut off a corner of the yardage, and went outside. I lit the pointy end with a match and watched it burn. I waited for it to cool, then I picked it up and when I rubbed it between my fingers, the residue was a soft ash. This is the case for natural fibers such as cotton, rayon, linen, silk, etc. For the sake of comparison I cut a triangle from a fabric I knew was a polyester. You can see the light reflecting in the “plastic-like” burned semi-circle on the fabric, and the small black piece was stuck to the cement. Man made fabrics like polyester and nylon melt rather than ash. The next day I pulled out some beautiful scraps I wanted to use in my next challenge quilt. They were given to me by a woman I stayed with when I taught for a quilt guild in Eau Claire, WI. She told me there was a men’s necktie factory nearby and they sold their scraps by the pound. She then gifted me with a bag full. The interesting thing was the ash was not as soft as the cotton fabric and it had a bit of a gritty feel when I rubbed it between my fingers. I guess I’ve never burned silk before because I was a little surprised by this. Do any of you use this test for your fabrics? Any other thoughts you’d like to share 🙂 ? Welcome back to my spandex quilting adventure! Sewing on this non-traditional fabric presented a number of problems. Not only did the copper spandex fabric show pin holes and drag when satin stitching with a walking foot, but I couldn’t find any way to mark it for quilting. I could mark on the black, but that wasn’t good enough. Then the real problem came when I tried to free motion. It would go smoothly for a while, then the spandex would begin to drag and pucker under my hopping foot. What a DRAG!!! When free motioning, there is no way to place paper under the foot, as I did when satin stitching. What to do??? Well, I was able to do a lot of straight quilting first to anchor everything. Next, I free motioned in the black fabric (where there was no drag). Here’s the exciting part: the straight line grid quilting I’d already done framed in where the free motion quilting would go. So I flipped the quilt over and free motion quilted my spirals from the back. It worked great! Some areas were quilted heavily and others weren’t quilted at all. The effect was what I was hoping for, and here’s the finished quilt! So Why is it called “40 Wonderful Years”? Well, when creating the design, I needed a focal point for the center. I wanted to use Art Deco lettering, as that was very popular during the Art Deco period. But what “word”? You may remember that my husband and I just celebrated a landmark anniversary (click here for that post). On our first date (in 1972), we went to dinner and a movie, and then we walked along Bradford beach on Lake Michigan in Milwaukee, and this romantic man drew our initials in the sand. I decided to return the compliment 🙂 ! I hope you enjoyed my spandex adventure. Any questions? While at the Sister’s Quilt Show Expo in Oregon this past Summer, l happened upon the Babylok™ booth and was intrigued by a sample the rep had made using swimsuit material. Because the fabric was shiny and stretchy, the machine quilting was dimensional and dynamic. Then, on our way back to Portland, we stopped at a huge fabric store and I found a piece of metallic copper spandex knit – on a clearance rack! I went home with 2 yards. When the Milwaukee Art Quilters chose “Art Deco” as their large challenge theme this year, I knew I had the fabric and the quilting idea, I just needed a design. I did a bit of web-surfing and found a site with instructions for creating “Great Gatsby Style Patterns” in Photoshop. (in case you’re interested it’s: http://blog.spoongraphics.co.uk/tutorials/how-to-create-a-great-gatsby-style-art-deco-pattern). After a bit of trial and error I chose a design. Next I made a few small stitching samples with a variety of different batts and stabilizers, so I could try stitching on this very non-traditional fabric and see what worked best. I then layered it on the copper spandex fabric, both right sides up. Next I placed this on the wool batting and stabilizer I had chosen. I pinned in areas where the black fabric would not be cut away, because the copper fabric shows pin marks. In black thread, I stitched on all the soap lines using a walking foot. The black fabric was cut away, close to the stitching, everywhere I wanted the copper to show. Next, all of the raw edges needed to be satin stitched. When satin stitching, the spandex would begin to drag under the toe of the machine foot while the toe on the black fabric moved fine. This sheering effect was not working at all, but I was able to slip a piece of paper under the spandex side of the machine foot and then it stitched quite well. Once the appliqué was done, I layered everything over a piece of flat cotton batt, and the quilt backing fabric, re-pinning in the black fabric areas once again. Stay tuned, in my next post I’ll cover the trickiest part – the quilting! Find Fabric and Take a Class! I’m bookmarking this page for future reference :-). I thought this week’s post would be a good time to share some of my upcoming local classes (with apologies to those who don’t live in southeastern Wisconsin). Quilting classes are held at the downtown Waukesha Campus. Wendy Rieves and I are the quilting instructors. To register for one of my classes or see the list of Wendy’s, please go to www.wctc.edu, click on Class Search, type “quilting” into the subject box and then click on Submit (to see a picture of the project simply click on the class title). This semester I’ll be teaching three Thursday afternoon Open Lab four week sessions. The dates are: January 10 to January 31, February 14 to March 7 and March 28 to April 18 and the classes go from 12:30 to 3:30. This is a great opportunity to finish up UFO’s, Get help starting a project your struggling with, layer and pin a finished top and so much more. I also do a brief demonstration each week on some pertinent aspect of quilting and finishing. I will also be doing 2 Friday workshops: Black, White and Bright (1-18-13) is a bed sized quilt that combines simple strip piecing of black and white prints with paper pieced flying geese in a very modern looking quilt. Playful Gradation (2-8-13) creates a bargello effect in a quick and easy way by using a printed gradation fabric. My project is wall sized and has fused sheer embellishments, but other finishing methods will be brainstormed in class. Its a “quilt as you go” style project and the faces are actually created by using a reverse machine applique technique that allows the batting (we used polar fleece) to shine through! Couching and machine embroidery from behind were other techniques used. Here’s Barb Jordan’s finished quilt! Thanks Barb and Darlene for letting me share your quilts! You may register by calling Ben Franklin at 262-567-0271. I will also be teaching a one day class at Hustisford High School (Community Ed) called Spinstar. The project is a table runner that is made of stars created using a “Stack n Whack” type technique where a large print is strategically cut to yield kaleidoscope stars. For more information contact Cindy Fitzsimmons at ce@hustisford.k12.wi.us. I am blessed with many opportunities this coming year to share my lectures and workshops with guilds around the country, so I hope to see many of you in the very near future :-)! Thanks to everyone who responded to my survey about quilt classes a few weeks ago. It was interesting to see how many of you like scrap quilts and it got me thinking about a technique I developed for sorting my scraps by value. Value is the relative darkness/lightness of a fabric and it can make or break many quilt patterns. I came up with a value sorting technique when I was making a quilt I called Almost Charming. I had been in my guild’s 6″ square exchange and decided to use those squares in the Friendship Star pattern and this ended up becoming a very popular class. A true charm quilt has only one piece of each fabric used. Because I cut each square into triangles, there are two pieces of each fabric and thus it is “Almost Charming”. When sorting scraps for a quilt, some patterns require just lights and darks, with the mediums needing to be removed for the pattern to work. Other patterns need lights, darks and mediums, but if there isn’t a clear delineation between the values, the pattern can get lost. The Friendship Star uses darks in the stars, lights in the background (which becomes the diagonal lattice when the blocks are set together) and mediums in the remaining “on point squares at the corners of each 9 patch star block. 3. Now do this for the original light pile. 4. Here’s the tricky part (remember not to overthink anything) – of the four piles before you, set the dark/darks and the light/lights aside. Now sort the medium/dark pile from step 2 into 2 piles: dark and light; and sort the medium/light pile from step 3 into 2 piles: dark and light. This will give you 4 medium piles. 5. By removing two of these piles there will be a definite difference between the darks, the mediums and the lights. The pile on the far left and the pile on the far right above need to be removed. The two center piles will be combined to form the “mediums”. So here you have it all. The 3 piles along the bottom of the picture are the dark, medium and light piles. The 2 piles at the top of the picture are the ones set aside for use in a future quilt. So what are “Beautiful Buts”? I hope you found this helpful. Do you have any helpful tips for sorting by value? I’ll be teaching at Nancy’s Notions Quilting Expo this week and have been very busy making up kits for my classes. When I realized how full the classes are (praise the Lord :-), I did a bit of panicking because kit making can be a bit overwhelming. My first thought was to just rush to my local Joann’s because it’s close and easy. 1. I use quilt shop quality fabric in my quilts and should do no less for the projects my students will be making! 2. If we don’t patronize our local shops, we’ll lose them! So I’d like to get on a soap box and take a stand for quilt shops. One of my favorite shops in the Milwaukee area was Fabric Fusion. It had an artsy personality and was owned by a hard working and creative couple. A friend recently related that quilters would go to Fabric Fusion, choose fabrics they liked, and write down the bolt information so they could go home and order it online for less. How disappointing. And this is a contributing factor to why Fabric Fusion is no longer with us :-(. So, support your local quilt shop! It requires a lot of hard work and dedication to run a shop and it’s a tough business to keep finiancially profitable. Shops also provide many helpful services. We quilters are very tactile and neeeeeeeeeeed to touch fabric when we buy it. Now this doesn’t mean I don’t want to keep my local Joann’s in business too. That store provides numerous jobs as well as a good price for non-fabric items that I need regularly. The hours are also quite convenient. Thus I really do like to spread my quilt shopping around. I’ve been doing a lot of “thread tail hiding” on my latest quilts, using the technique I illustrated in my March 27th post called Loose Ends: http://clkquilt.wordpress.com/2011/03/27/loose-ends/. I’m using the standard self threading needles and they work well, but sometimes they’re a bit tricky to pull the thread into. I decided I needed to try this “side opening design”, even though it was packaged as one of those “as seen on tv” deals. Please don’t waste your money! The needles were thick, dull, expensive and quite difficult to thread. Well, as of today the kits are together (with help from my dear husband) and I’m anxious to finish packing. Nancy’s Expo is always such fun. Hope to see many of you there! I just received a comment from Sarah B. informing us all that the original “Spiral Eye Needle” was designed by a woman named Pam Turner and is made in the USA. 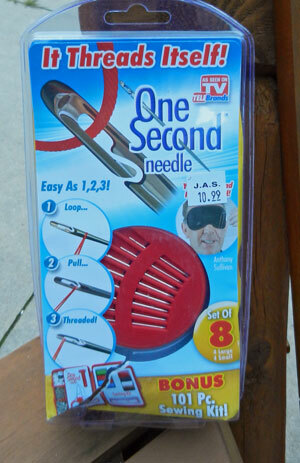 Sarah said that these needles are great, so I went to the website and ordered a set. I can’t wait to try them and I’ll be sure to share my thoughts in a future post :-)! What great comments. I especially liked the expression “shopping your stash”. Thanks Cindy. I think many of us could make wonderful quilts without ever making a trip to the quilt shop. I was very convicted by Pat’s challenge to use my Liberty fabrics and they’re hanging on the design wall now just waiting for the right idea to grab me. (this may happen after the holidays – we’ll see). While I was writing the “Too Beautiful” post I came to realize that I actually had reached the point a few years ago that when I buy a fabric I really love I allow myself to use it as inspiration for something new right away. The blendable, “tone on tones” go into the stash, but when the new, jaw dropper, makes my fingers start to itch I’ll often just ignore the guilt of that project I’m in the middle of (which isn’t as exciting as when it was first begun) and indulge in playing with the exciting stuff. Another method I’ve found helpful lately is to put the new gorgeous stuff in the stash just until the next time I’m ready to take a new challenge or I need to come up with a new class project. Then I grab that inticing piece and allow it to be the impetous for this new endeavor. This usually helps to get the ball rolling. Picking out other fabrics to go with the exciting one is always such fun for me. The only problem with this system is that the great fabrics from my “petting and not using” days are still in the stash. So, thanks to Pat, I’m going to focus on some past loves. Who knows, some of them may look great together. Mary Beth made a comment last week that inspired this week’s topic. She said she had received a piece of fabric in an exchange with a quilter in Africa and it was too special and unique to cut into. Haven’t we all been there? In 1989 my husband and I vacationed in London. 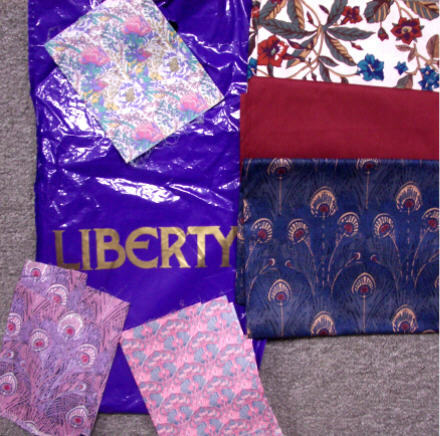 Liberty’s of London was at the top of my list of destinations because I’d heard so much about their fabrics. They were beautiful and had a lovely silky feel. My husband was indulgent and I purchased a meter of 3 different yards and a few scraps from a bin. For years I would take them out and pet them and then put them right back in the purple plastic Liberty bag (duh!). That’s where I found them today. This reminds me of a quote from Ricky Tims: “If you never use it, you’ll never use it”. I used to love it. Now I don’t. What a waste. Admit it. You’ve done the same. Please let me know your philosophy on this issue by commenting at the end of this post and I’ll have a few comments on Thursday :-).